We are excited to unveil the name of The Grove’s third tower as the building heads towards completion. Sterling adds 293 exquisitely designed and furnished residences to the 106-acre resort, with sales scheduled to start in Summer 2019. The two- and three-bedroom vacation homes range from 1,250 square feet to 1,550 square feet and are priced from the low $300,000’s. When all the residences are completed, The Grove will consist of 878 luxury vacation homes five miles from Walt Disney. Completion of the third tower includes finishing the interiors of the luxury two- and three-bedroom suites as well as the common areas. The residences at Sterling will qualify to be part of The Grove’s comprehensive hotel rental program, where the luxury condos are fully managed by BENCHMARK®, a global hospitality company. 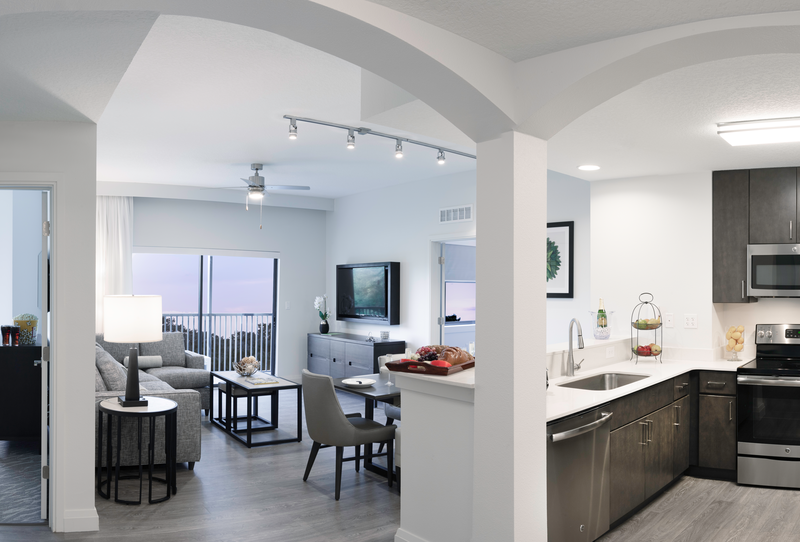 The residences come with full kitchens, living and dining areas, full-size washer/dryers, and screened patios to provide owners and vacationing families the comfort of a home away from home. Sterling owners will benefit from The Grove’s state-of-the-art amenities such as our Surfari Water Park, which features twisting tube slides, a lazy river, kids’ activity pool, and a FlowRider® Double surf simulator; the Flip Flop’s Family Fun Center; a full-service spa, three additional swimming pools, water sports at Lake Austin Pier, a large-scale grab-and-go Alfresco Market; Longboard Bar & Grill at Surfari Water Park; The Springs Bar & Grill at The Springs pools; The Grove’s main restaurant, Valencia; and the Element lounge.They will also receive free transportation to and from Walt Disney World.